How to Stop the Relationships Blame Game - Something New Everyday! Most of us have learned defensiveness as a mode of survival. For some of us, this approach manifested itself in our adult minds and continues to control our lives, especially in relationships. 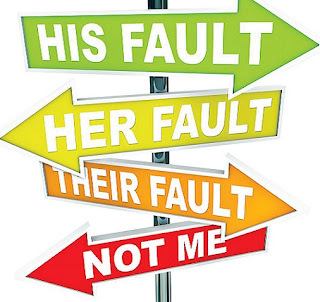 Blaming the other person for your misery and continuing in the vicious circle of the "blame game" is not only damaging to the quality of your relationship but also unhealthy for your emotional well-being. Step 1 : Understand how you contributed to the problem. Analyzing the mistakes on your part is the first step to finding a solution. There is really no soul-quenching satisfaction in proving that you are right and he is wrong. As how Louis Nizer puts it, "When a man points a finger at someone else, he should remember that four of his fingers are pointing at himself." Step 2 : Take responsibility for all your actions and words. Regardless of how victimized you feel, remember there are two individuals contributing to a relationship. Admit your mistakes, offer ways to correct it and avoid its recurrence. Step 3 : Communicate your concerns without assigning responsibility or blame to the other person. Deal with issues in a calm manner instead of letting things fester without taking the time to resolve the issue. Step 4 : Remember that you can inspire and motivate someone else to change but the initiation has to come from the other person. Criticizing and complaining, of all tactics, is not going to effect a change. A relationship should never be a power struggle about who is right. Step 5 : Accept the other person entirely instead of having conditions and expectations. Trying to find fault will overshadow the beautiful things that are genuinely a part of your relationship. Step 6 : Respect the other person's point of view. Try not to assume that dealing with an issue based on your values and beliefs is the only right way to go about it. Understanding and acknowledging the other person's outlook gives a chance to grow in love.